Over a thousand young basketball players from Baguio, Benguet, Nueva Ecija, Tarlac, La Union, Ilocos Sur, Pangasinan and other nearby provinces joined the Jr. NBA Philippines North Luzon Regional Selection Camp at Benguet State University in La Trinidad on March 23 and 24. A young Jr. NBA participant keeps her eyes locked on the ring as she tries to escape her opponent’s pesky defense. After two days of basketball drills and exercises, seven boys and two girls exhibited outstanding oncourt skills and embodied the core values of the game and will move on to the next stage of the program—the Jr. NBA Philippines National Training Camp-- in Don Bosco Technical Institute Makati on May 17 to 19. A roster of 40 boys and 40 girls will be gathered from the Jr. NBA Philippines Regional Selection Camps in Benguet, Butuan, Dumaguete, Lucena, and Metro Manila, and a select group from the Alaska Power Camp. Players from across the archipelago will showcase their talents and vie to be named as Jr. NBA Philippines All-Stars. “What I’ve noticed here in Baguio is that there are a lot of good dribblers. The kids here are very competitive, very enthusiastic. They’re working hard. The three questions I always ask the kids —Did you have fun? Did you give your best? And the last one is, do you love basketball? And it’s all, “Yes! Yes! 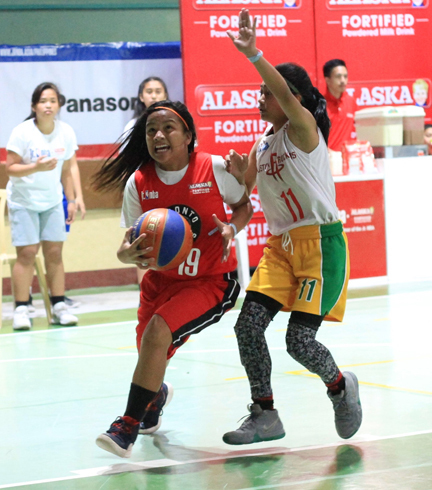 Yes!” and I think that’s our goal here, making sure that the kids are learning basketball, they’re having fun and more importantly they are giving their best,” said former PBA player Tony dela Cruz from presenting partner Alaska. The Asia Pacific regional competition will provide the 2019 batch of Jr. NBA All-Stars the opportunity to represent the region in the Jr. NBA Global Championship that will be held Aug. 6 to 11 at ESPN Wide World of Sports Complex at Walt Disney World near Orlando, Florida. The international event will feature talented youth from the United States, Canada, Latin America, Europe, the Middle East, China, Mexico, Africa, India and the Asia-Pacific. Boys and girls aged 10-14 years old can join the remaining Jr. NBA Philippines Regional Selection Camps in Dumaguete (March 30 and 31), Butuan (April 13 and 14) and Metro Manila (April 27 and 28) by registering at www.jrnba.asia/philippines.